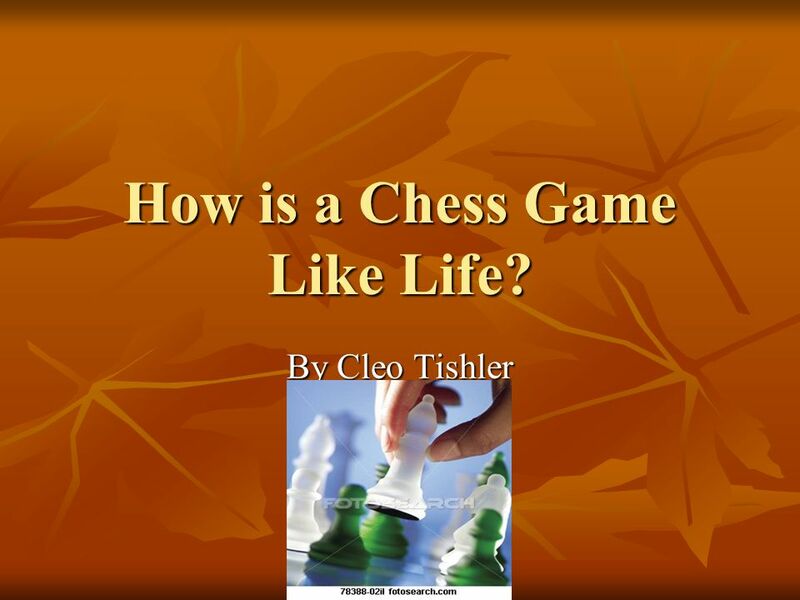 How is a Chess Game Like Life? 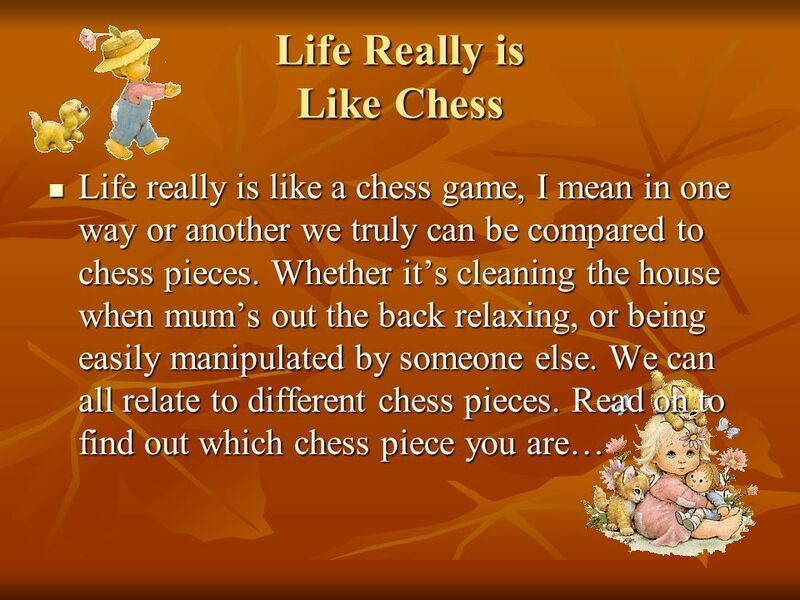 1 How is a Chess Game Like Life? Chess pieces in real life. 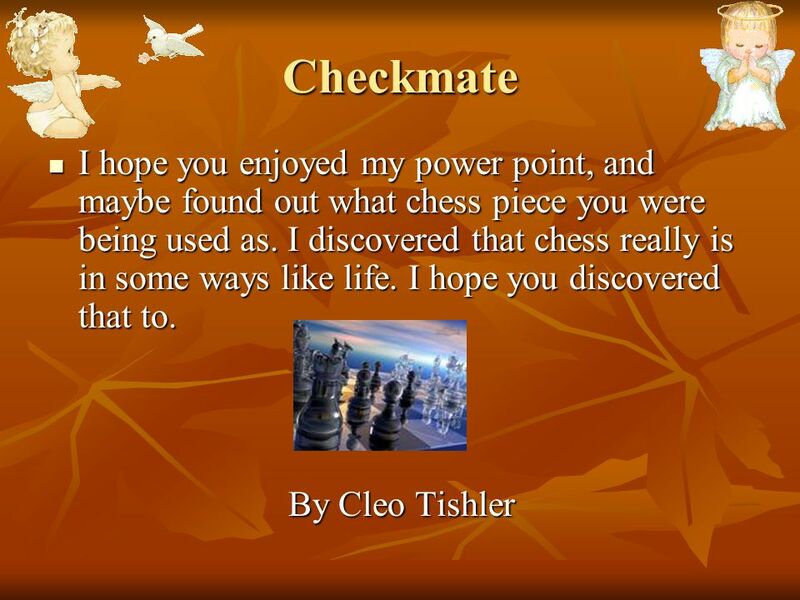 Are you being used as a chess piece? Pawn-Doing things not on your own accord, but on the act of someone else's. You don’t even care if it is wrong or right. Easily manipulated. Castle-Big, tough, maybe a bully or a Drill Sergeant, commanding pawns. Firm, solid. Knight-Brave, maybe a War Solider or standing up to someone intimidating. Assertive. Bishop-Second in charge, possibly a Deputy Principal or an assistant. Queen-Elegant but can also be a good ruler. Don’t get on the wrong side of Queen. Dramatic, significant, key player. King-Boss, head of the house, dad (or mum). High and mighty, director. 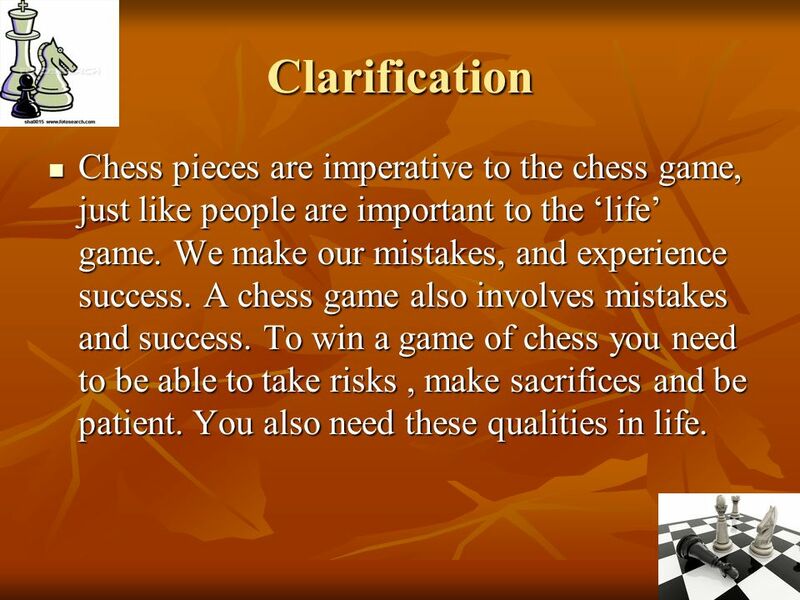 5 Clarification Chess pieces are imperative to the chess game, just like people are important to the ‘life’ game. We make our mistakes, and experience success. A chess game also involves mistakes and success. To win a game of chess you need to be able to take risks , make sacrifices and be patient. You also need these qualities in life. 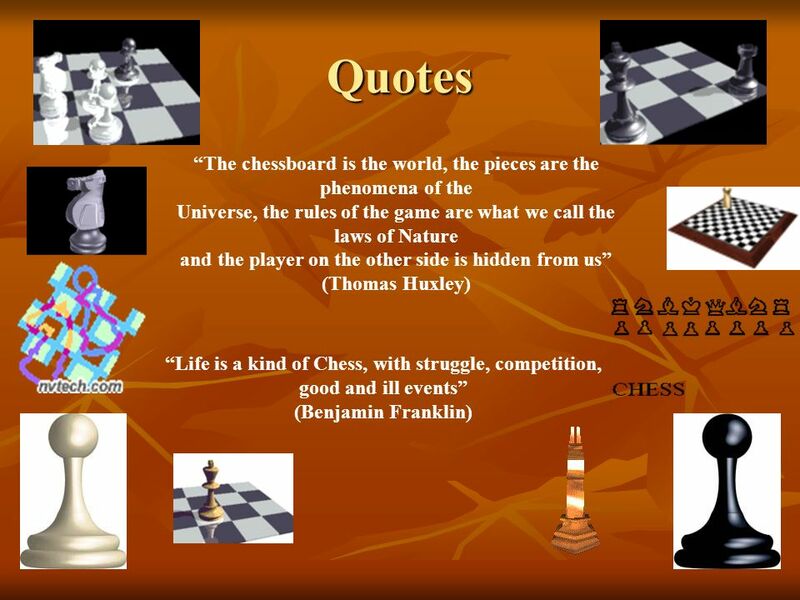 Download ppt "How is a Chess Game Like Life?" 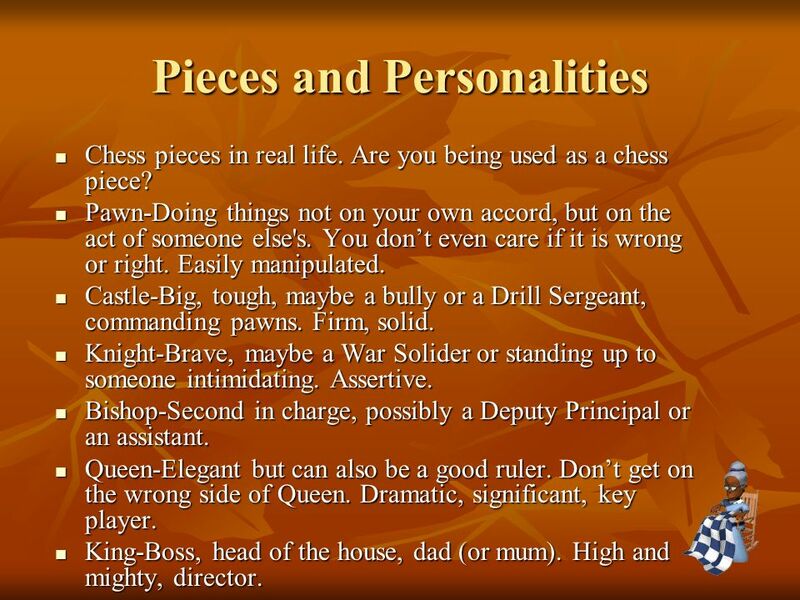 A guide to fuedalism CHESS PIECES.  Many of you are probably familiar with the game of chess. But did you know chess has been played for over 5,000 years? The Final Move! By Jonathan Leonor. Daniel is in a tough situation because he only has one move left to checkmate his opponent other wise it will be a.  My football coaches are always pushing us too be the best player we can for our team and too give 100% of your effort each and every down you are on. Chess Merit Badge Chess Basics: Set Up the Board & Basic Rules by Joseph L. Bell © 2011. A Beginners Guide. The Pieces Chess consists of Sixteen pieces eight Pawns two Rooks two Knights two bishops one Queen and one king this guide will show. Empathy and Being an Ally Giving and Getting Support.